Exceptional base rock. Add live rock to your tank and this rock will take off for a fraction of the price of some of the ugly looking live rock. Free shipping. Exceptional base rock. Add a small live rock to your tank, or a scraping of coralline to seed the tank and this rock will take off. You may be able to find cheaper rock, but you won't be able to find base rock of this quality for less. The rock comes covered with holes and crevices for your fish to swim through and hideout in. Its interesting shapes make it easy to stack and create stable aquascapes. It has been professionally cleaned and dried after a long soak in a deep water well to prevent leaching of phosphates. This rock is free of organics except the dust that may settle on it during transport. Because of this it can be added to an established tank without causing a cycle. The products pictured here are not a "cherry picks", they are standard for the quality we carry. The rock is porous, and will provide anaerobic areas for denitrifying to grow, which will reduce nitrates in your tank. (If you are having trouble seeing the pores in the next picture, right click it and select view image for the full sized picture). This rock contains No pests, and it is professionally cleaned so no need to cycle/cure - it is devoid of organic compounds, and has been treated to prevent phosphate leaching. Rinsing rock dust from the rocks is a good idea though. You can use fresh water for this task. It is generally recommended that you get 1.25 - 1.5 pounds of liverock for each gallon of your tank. (So if you had a 10 gallon tank 13-15 pounds is "the standard"). For filtration, it isn't the weight that matters but the amount of surface area that matters. Our rock has a lot of holes and odd shapes that give it a lot of surface area. You can get adequate surface area for the nitrogen cycle with less than the "standard" amount, but I wouldn't go to far less, the standard isn't based on run of the mill rock either. 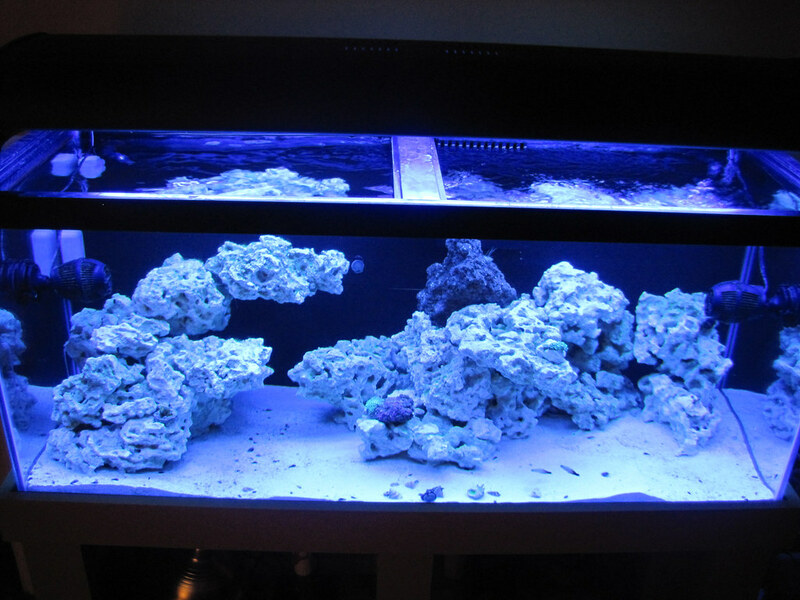 If this is your first reef tank, remember you will probably want some seed rock, as well as room for coral colony rocks later on. We understand that aquascaping is a decision that is hard to leave in the hands of someone over the Internet. We want you to be confident in your selection of our products, ask the members of the clubs and forums we sponsor what they think of rock they received. This rock is mined from an ancient reef 30 miles inland, in an environmentally responsible manner. It has the same natural composition of living reef rock. By purchasing this rock, you will not be harming a wild reef. 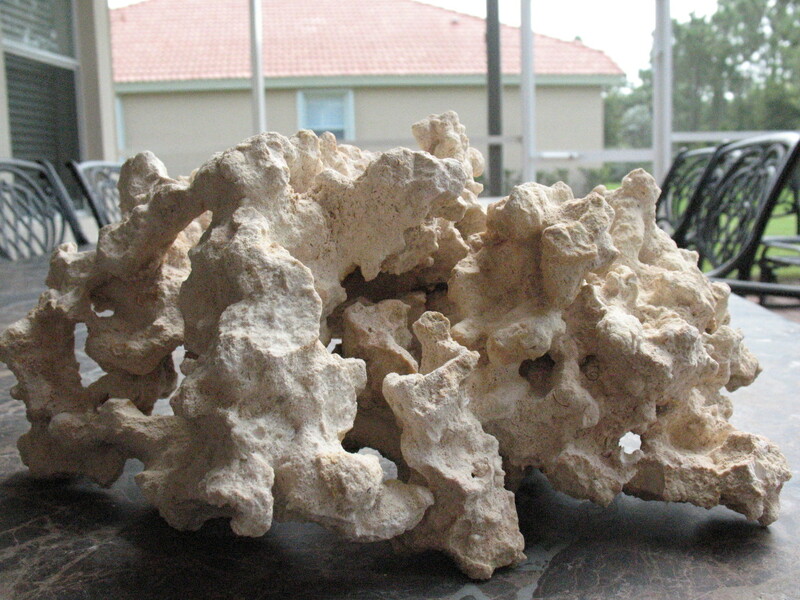 We do not carry any rock that was collecting from a living reef. You are encouraged to tell us what size rocks you want, and what size tank it is going in. We will try to accommodate specific requests as best we can. However, the margin is so slim on rock we WILL NOT issue refunds or replace the rock. Never refuse a rock shipment. No livestock can be shipped with our rock. Discounts cannot be accepted on rock. WE DO NOT SHIP ROCK TO PUERTO RICO (in addition to the places we normally do not ship to).